I began listening to it earlier this year when the original host David Hernández, who is a Medieval astrologer from Puerto Rico, starting featuring interesting interviews with prominent astrologers such as Benjamin Dykes and Robert Schmidt. 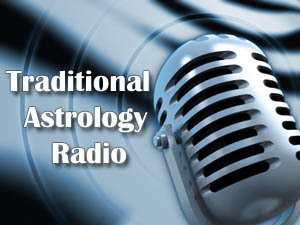 Traditional Astrology Radio is typically an hour long show that is streamed live over the internet, and after it is over you can download a full MP3 of the show for free if you missed it or if you just want to listen to it again later. In September an astrologer named Jacqui Menkes, a graduate of Kepler College, took over the radio show from David, and she has continued and even expanded his practice of conducting interesting interviews with prominent astrologers during each show. I’m excited about Jacqui’s upcoming lineup of interviews over the course of the next month, which will feature astrologers such as Bruce Scofield, Maria Mateus, and Robert Corre. You can also go back in the archives and listen to or download past interviews by David and Jacqui with Ben Dykes, Robert Schmidt, Lee Lehman, Christopher Warnock and a number of others. I did an interview with Jacqui last month on the subject of Hellenistic astrology, and you can listen to the entire podcast online or download it as an MP3 here. I was sick with the flu at the time, so it wasn’t the best interview that I’ve ever given, but it is still worth listening to. As I said in the interview, I think that Jacqui is doing a great job after having taken over from David, despite having some pretty big shoes to fill. I think that her background as a Kepler student gives her a broad perspective that will make the show interesting and thought-provoking for a long time to come. Update in 2012: I started a new show called The Astrology Podcast. Just listened to your 5th Podcast as you did a post mortem on the Obama election charts and your decision that the horary technique of asking “Will Obama/Democrats win the next election?” is not the best technique to use. I think this negative verdict calls into question the motivation of the astrologer asking the question and this simply cannot be known by anyone else. No one can know what is in the mind and/or heart and/or what is the spirit of intention of the astrologer. Not unless you do another horary to discover what is in the heart of the astrologer! On that ground alone therefore I would dispute what you say. Strongly. All that is required for a horary to work successfully is good intention and correct motivation (plus a half-decent horary astrologer, of course!.) Not just idle curiosity or passionate optimism one way or the other but proper intent and motivation. No one can – logically – question this because it is not in anyone’s mind except that of the astrologer or querent at the time. The astrologer can, of course, know if the querent is testing them with ‘silly’ questions from the horary chart itself. Note that I’m not saying other techniques ought not be used as well as horary. They most certainly should : natal charts, event charts (for the midnight after voting preferably) and location is also important. But there can be just as many variations on those charts by as many astrologers too! Altogether, very interesting – especially the VOC Moon stuff. Well done. Good to find something coherent and interesting! Thanks.